Chiang Rai in far northern Thailand is a bit off the beaten path for most foreign tourists golfing in Thailand. 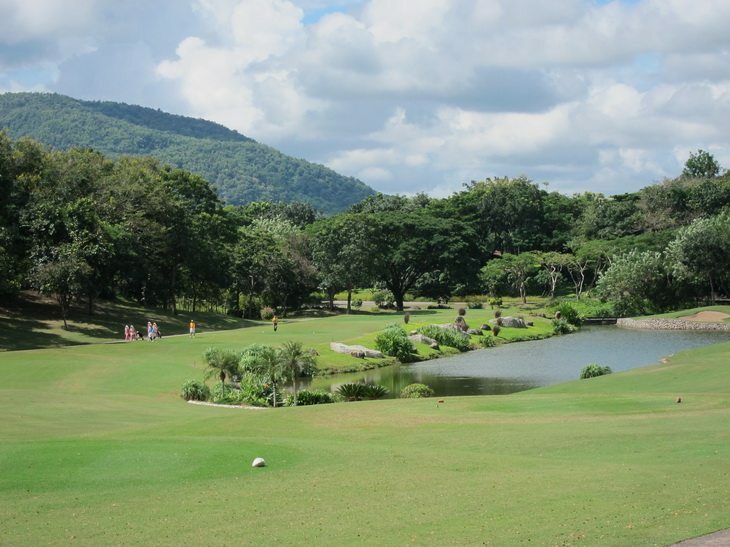 However the Robert Trent Jones Jr. designed Santiburi Chiang Rai Country Club is a name that often comes up when Thai residents talk about their favorite Thai golf courses. While there is no one single outstanding quality to the course, it is instead a combination of factors that all come together in creating a thoroughly enjoyable playing experience: the scenery with rolling terrain and tree lined fairways, challenge, playability, diversity, maintenance and service. Jack Nicklaus once said that “Golf is a better game played downhill”, and Santiburi uses this concept to great effect with several elevated tees and downhill holes which invite golfers to ‘tee it up and have a go’. The clubhouse itself sits on one of the highest points of the property, providing excellent vantage points for viewing the action on #9 and #18 as well as creating elevated tees for #1 and #10. Donald Ross preached that the first hole of any golf course should be designed to allow golfers an encouraging start without too much trouble. The opening hole at Santiburi does this with a medium length par five that has enough elbow room both left and right that mishit shots can at least be found and played. However miss the fairway and you will quickly learn what gives Santiburi its primary line of defense: the Rough. Gnarly Bermuda rough, the kind found on many courses in the southern USA, that wants to grab your club and twist it, that is thin at ground level but spreads out at leaf level and thus invites balls to nest down in it, that will make you think twice or thrice about what club to use, and that makes even a simple greenside pitch a challenge. Water is also used on numerous holes though is not overdone. Hookers beware though as water comes into play down the left side on the 2nd, 4th, 5th and 8th holes. Slicers might feel they’ve been given an easy ride for the first 16 holes though anything right on the par-3 17th or into the approach on 18 will definitely be wet. Bunkers are also not overdone but well placed. A number of holes provide good ‘risk and reward’ balance, offering both a direct but dangerous route to the pin as well as a more comfortable bailout area for the more risk averse. A great example of this is the signature par-5 18th. This is a double dog leg with water down the left off the tee and right for the 2nd and 3rd shots. Low handicappers though will be tempted to have a go for the green in two IF they can hit a well placed drive. All Thailand golfers regardless of handicap can enjoy Santiburi Chiang Rai by picking the proper tees. While the Gold tees stretch the course to over 7,000 yards with more difficult angles, the White tees are a tame 5,800 yards for high handicappers and the in-between Blue tees 6,500 yards for mid handicappers. Santiburi is definitely not to be missed by anyone golfing in Chiang Rai Thailand. Chiang Rai is a quiet town though makes a nice place to golf and relax for a few days, and combines easily with Chiang Mai for longer stays. Both the Chiang Mai and Chiang Rai airports have convenient multiple daily flights to/from Bangkok, and are inter-connected by a scenic 3 hour drive though the northern mountains. Try the northern Thailand golf combination on your next trip and you will have just discovered one of Thailand’s best golf destinations. Sea Pine Golf Course: Nice But Be Aware Of….